King King, on the corner of La Brea and 6th Street, was a faded Chinese restaurant until Mario Melendez and his family bought the place and turned it into one of the hottest jam spots in town. On Tuesdays, the Afro-Cuban sessions are led by a seven-piece, virtuosic house band, with the best and the brightest of the local Latin jazz scene sitting in. As the house players set up, a deejay spins classic Cuban records from the 50's, and when the band takes over it's clear they're loyal to the legacy of the masters. Bassist "Tupelo" Joe Altruda plucks an acoustic wooden bass (rarely seen at salsa gigs these days), and a legion of skilled musicians circulates onto the bandstand, trading off at congas and cowbells and solo instruments, in what seems a high-spirited, congenial competition. Finally, Tony Rosa cues the mambo - the climax - with his cowbell and the dancers are driven to a feverish crescendo. 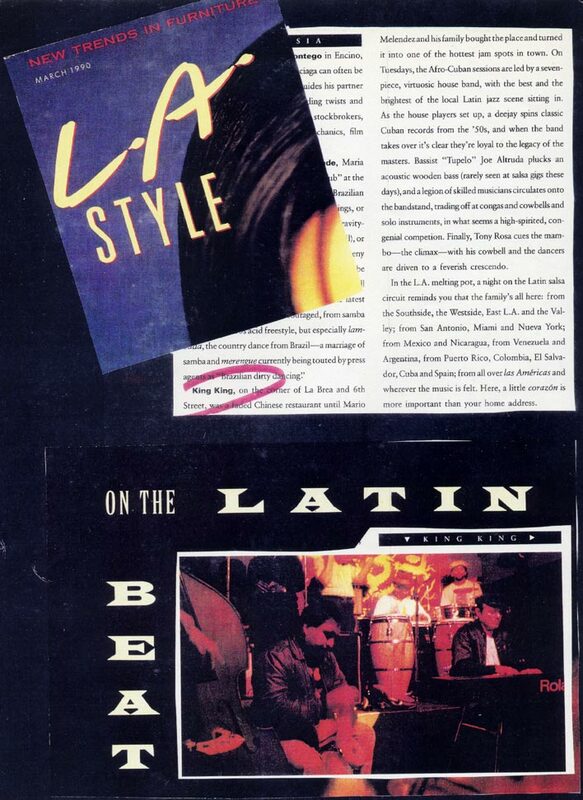 In the L.A. melting pot, a night on the Latin salsa circuit reminds you that the family's all here: from the Southside, the Westside, East L.A. and the Valley; from San Antonio, Miami and Nueva York; from Mexico and Nicaragua, from Venezuela and Argentina, from Puerto Rico, Columbia, El Salvador, Cuba and Spain; from all over las Americas and wherever the music is felt. Here, a little corazon is more important than your home address.